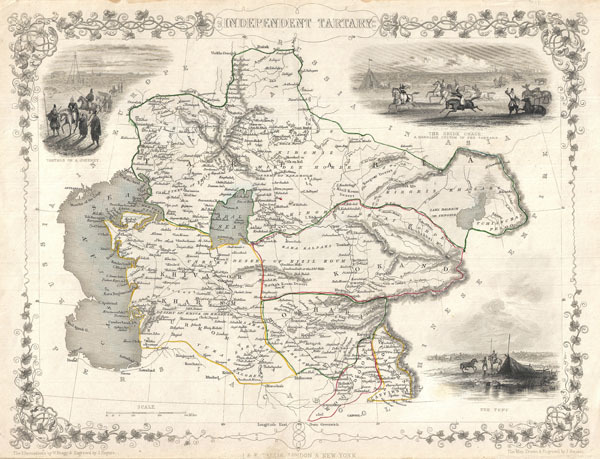 A highly decorative 1851 map of Independent Tartary by John Tallis and John Rapkin. Covers the regions between the Caspian Sea and Lake Bakquash and between Russia and Afghanistan. These include the ancient Silk Route kingdoms of Khiva, Tartaria, Kokand, and Bokhara. Today this region roughly includes Kazakhstan, Uzbekistan, Turkmenistan, Kyrgyzstan, and Tajikistan. This wonderful map offers a wealth of detail for anyone with an interest in the Central Asian portion of the ancient Silk Road. Identifies various caravan routes, deserts, wells, and stopping points, including the cities of Bokhara and Samarkand. Three vignettes by W. Bragg decorate the map, these including an image of Tartars on a Journey, a horseback Bride Chase, and a tartar camp site. Surrounded by a vine motif border. Engraved by J. Rapkin for John Tallis's 1851 Illustrated Atlas. Very good. Narrow bottom margin, as issued. Mild overall toning. Blank on verso. Rumsey 0466.045. Phillips (Atlases) 804.